4-stroke rivals, beware: this tool might just be the sharpest in the shed. If you want torque by the bucket loads, a top-end to die for and a lightweight chassis ready to rise to any occasion, give this fuel-injected 300cc lightning bolt a go. CYLINDER The KTM 300 XC-W TPI cylinder has a bore of 72mm and is fitted with the sophisticated power valve, which provides really smooth and controllable power characteristics. For the EFI application the cylinder features two lateral domes that hold the fuel injectors supplying fuel into the rear transfer ports. The downstream injection guarantees excellent atomization of the fuel with the upstreaming air. Thus the loss of unburnt fuel is minimal for fewer emissions, a more efficient combustion and reduced fuel consumption. A little tube in the back of the cylinder is connected with an intake pressure sensor, which supplies pressure data to the control unit. CRANKCASES AND ENGINE COVERS For optimal mass centralization the lightweight die-cast crankcases hold the clutch shaft and the crankshaft in a high position close to the center of gravity for quick handling and a light feel. In addition, it allows the implementation of a balancer shaft. So your ride will be as relaxed as it is rapid. Plus, your new favorite engine will keep looking as fresh as the day you bought it: the engine covers feature a surface structure that reduces the wear caused by the rider’s boots. TRANSMISSION This 6-speed Enduro transmission features an Enduro-specific wide-ratio specification and provides precise and easy shifting. An advanced ´No Dirt´ gear shift lever design prevents mud and dirt from blocking the joint. Because even dirt lovers hate mud when it’s in the wrong places. ENGINE MANAGEMENT SYSTEM The engine management system (EMS) of the TPI models features a control unit located below the seat. The control unit determines the ignition timing and the amount of fuel to inject is based on several sensor readings such as intake and ambient air pressure, throttle position, oil and water temperature. Thanks to altitude and temperature compensation the hassle and time of jetting a 2-stroke is no more. 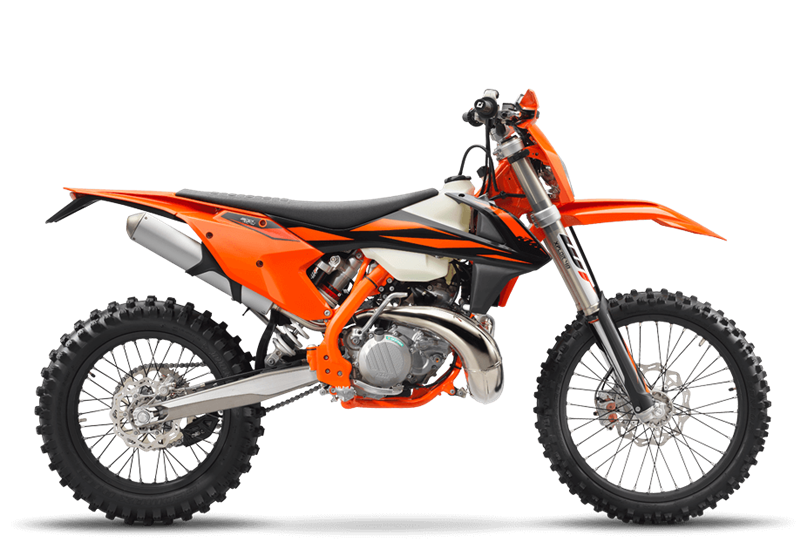 CLUTCH The KTM 300 XC-W TPI employs the KTM-developed DDS clutch (damped diaphragm steel) with a wear-free steel basket, extremely heat resistant clutch plates and nitrated steel liners. This clever design employs a diaphragm spring instead of the usual coil springs, making for considerably easier clutch action. A diaphragm spring also leaves sufficient space for a damping system to be integrated into the clutch hub. The goal is traction, but durability is as well. Light operation and telepathic amounts of control are standard with this hydraulic Brembo actuated clutch. OIL PUMP Pre-mixing 2-stroke fuel is a thing of the past for KTM XC-W TPI owners. An electronic oil pump feeds oil from the oil tank via the throttle body into the engine intake, and ensures a perfect fuel-oil mix in all conditions and engine speeds. The system, which reduces up to 50% of the smoke from the exhaust system over carburettor models, is managed by the control unit based on the engine’s revs and load measured by the TPS (throttle position sensor). The oil capacity of approximately 0.7 liters is enough for 5-6 refills of fuel, giving you more time to ride, less time measuring things out. THROTTLE BODY The TPI engine is fitted with a 39mm throttle body made by Dell`Orto. The airflow is regulated by a butterfly connected with a twin-cable throttle cam, which is operated by the handlebar throttle assembly. A throttle position sensor provides airflow data to the control unit, while a bypass screw allows the regulation of the idle speed. The cold start device also opens a bypass supplying more air. Via an oil intake tube oil supplied from the oil pump is mixed with the incoming air to lubricate crankshaft bearings and cylinder/piston etc. COOLING KTM’s proven cooling system routes the coolant from the cylinder head through the frame triangle, directly to aluminum radiators made by WP. The additional KTM PowerParts radiator fan is regulated by the EMS control unit for easy installation. Thanks to flow optimized internal circulation and CFD-calculated ventilation, the system is superbly efficient. In addition the radiator protectors improve heat dissipation. Especially in the mud. They are also integrated into the front part of the shrouds to protect the radiators in a crash. EXHAUST This nickel-plated pipe is produced by WP Performance Systems. It is designed for an optimal power band and maximal performance of the engine. A modern 3D production process guarantees top precision and reliability of the pipe, so this screamer is as tough as it is strong. FRAME The high-tech, lightweight chrome-moly steel frame has a knack for easy handling, outlandish rideability, precise cornering and excellent stability. You can also count on high torsional rigidity and low longitudinal stiffness. This results in better absorption of the energy created from the front and rear suspension sucking up jumps and bumps. In short: more comfort and less rider fatigue. Laterally attached, lightweight engine head stays (the connection between cylinder head and frame) contribute to a reduced vibration level. Two threaded inserts in the lower cradle tubes allow for safe fixation of an optional skid plate. The engineers could pull off all of this while making the frame 2.2 pounds lighter than that of the lightest competitor on the market. In addition, it is easier to maintain, easier to work on and supplies more space for the tank and other components. On the XC-W TPI models the upper frame tube features a slot where the oil filler cap is mounted, which feeds the oil tank via a hose inside the frame tube. The bike also features an extra-light subframe made of high quality aluminum, which tip the scales at less than 2 pounds. SWINGARM The cast aluminum design offers low weight and a perfect flex behavior. The single-component casting process eliminates any inconsistencies and inherent weak points created by welding. It’s good looking as well. WHEELS The XC-W wheels feature lightweight, CNC machined hubs and high-end Giant rims guaranteeing maximum stability at minimum weight. The wheels are fitted with Dunlop AT 81 tires – perfect for surefooted performance offroad. FRONT SUSPENSION The WP XPlor 48 upside-down fork is a split fork developed by WP in close collaboration with KTM. It is fitted with a spring on both sides, but features separated functions for each fork leg: compression damping is fitted on the left side, while rebound is on the right. So the fork can easily be adjusted for compression and rebound with the twist of a dial on top of the fork tubes (30 clicks each). In addition a sealed hydro-stop guarantees better resistance to bottoming-out. Due to high-quality materials and a state-of-the-art production process, the WP XPlor 48 fork – with approx. 300mm of travel – has outstanding response and damping characteristics. An optional preload adjuster allows for a threefold spring preload setting without any tools. Easy as one, two, three. REAR SUSPENSION The WP XPlor PDS system is a KTM trademark where the shock absorber is directly connected to the upper side of the swingarm. We don’t use any linkage.The progressive damping is achieved by a second piston, which works together with a closed cup towards the end of the stroke. This design contributes to an optimal progression behavior of the damping supported by a progressive shock spring.Various machined and anodized components and a distinctive WP color trim (black reservoir, white spring, silver body) make this a valuable, high-end product compared to the roughcast bodies of many competitors. You’d hate to see it get dirty. Almost. TRIPLE CLAMP The 300 XC-W TPI is fitted with forged triple clamps with an offset of 22mm, ensuring a solid grip of the fork and precise handling. The handlebar is adjustable forwards and backwards over 4 positions; this XC-W will fit you like your favorite gloves. BRAKES You couldn’t brake any harder, better, faster or stronger. These high-tech Brembo brakes are combined with lightweight Wave brake discs and are the ultimate solution in braking technology. First you outrun them, then you outbrake them. FUEL TANK This is a lightweight polyethylene tank with a capacity of 2.4 gallons. The XC-W TPI models incorporate an integrated fuel pump system and an additional fuel level sensor so you’ll always know when you’re running low on gas. AIRBOX The air filter box design offers maximum protection of the air filter against soiling, while ensuring maximum airflow. The large Twin Air air filter is mounted on a stiff cage, which at the same time holds the system in place. This design is so simple, you could still pop a fresh one in with a face full of mud. Without tools. In seconds. HANDLEBAR KTM engineers sure know how to handle handlebars. This tapered unit, made of high-strength aluminum by NEKEN, features a throttle assembly which has a twin-cable for TPI models just like their 4-stroke brothers with a double-cable aluminum body and straightforward free-play adjustment. A volcanized grip sits on the right, while on the left side of the bar a comfortable ODI lock-on grip is mounted, which does not require any wire or glue to be fixed. FOOTPEGS Sophisticated ´No Dirt´ footpegs prevent jamming up the pegs, even when digging in deep ruts. The pegs on the Enduro models are 6mm higher than the ones used on SX models, which benefits ground clearance. But you can swap them at will. DECALS New graphics convey the READY TO RACE character of the 2019 KTM XC-W model line. BATTERY & WIRING HARNESS A strong lithium ion battery breathes life into the engine and contributes to low vehicle weight. The lightweight battery and wiring harness are centralized in a compartment above the air filter box, allowing the mechanic to remove the subframe without removing the electronics. A happy mechanic is a good mechanic.